This article is about a type of ballroom dance. For other uses, see Foxtrot (disambiguation). W. C. Handy ("Father of the Blues") notes in his autobiography that his "The Memphis Blues" was the inspiration for the Foxtrot. During breaks from the fast paced Castle Walk and One-step, Vernon and Irene Castle's music director, James Reese Europe, would slowly play the Memphis Blues. The Castles were intrigued by the rhythm and Jim asked why they didn't create a slow dance to go with it. The Castles introduced what they then called the "Bunny Hug" in a magazine article. Shortly after, they went abroad and, in mid-ocean, sent a wireless to the magazine to change the name of the dance from "Bunny Hug" to the "Foxtrot." It was subsequently standardized by Arthur Murray, in whose version it began to imitate the positions of Tango. At its inception, the foxtrot was originally danced to ragtime. From the late teens through the 1940s, the foxtrot was certainly the most popular fast dance and the vast majority of records issued during these years were foxtrots. The waltz and tango, while popular, never overtook the foxtrot. 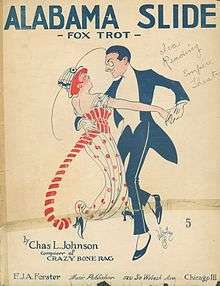 Even the popularity of the lindy hop in the 1940s did not affect the foxtrot's popularity, since it could be danced to the same records used to accompany the lindy hop. Three distinct styles of (slow) foxtrot are in common use among ballroom dancers today: the American Social Style, the American Continuity Style, and the International Style. All three are partner dances in which the dancers progress around the dance floor in a counter-clockwise direction, and are danced to much the same music. However, they differ significantly in technique, positions, and figures. The American Social Style was, and to some extent still is, widely employed in the United States as a social and party dance. It is particularly well suited to dancing in a crowded room, by partners who may or may not know each other well, and who may or may not have had much formal training in dance. Its defining feature is that the dancers close their feet at the end of almost every figure, as opposed to passing their feet as in the other two styles. As a result, the dancers progress fairly slowly around the room, and some figures can even be danced in place. Furthermore, almost every figure begins in much the same position, with the two partners facing each other squarely in what is called "closed position" and the man starting on his left foot. Since each figure leads so easily and consistently in the next, it is fairly easy for the leader to string multiple figures together on the fly in an ever-changing sequence. Body contact is unnecessary and not generally expected; all figures can be led through the frame formed by the arms. Hence, the potential social awkwardness of body contact between partners who do not know each other well, is avoided. As American Social Style is the only style allowed in Bronze (beginner) level American Style dance competition, this style is sometimes also known as "American Bronze Foxtrot". The American Social style uses both six-count and eight-count figures. The rhythmic alteration between the two, is one of the few potential difficulties in the dance. Syncopation is generally avoided. The six-count figures extend across one and a half measures of music, and utilize the rhythm slow (two counts), slow (two counts), quick (one count), quick (one count). Examples include: the basic movement forward and back, the alternating quarter turns (a/k/a zig-zag), the rock turns right and left, the promenade, the promenade twist (12 counts), the promenade pivot (12 counts), and the sway step. Social dancers generally use the alternating quarter turns to progress in a zig-zag pattern around the room, alternating for variety with the promenade. Rock turns are used for changes of direction in corners and to avoid collisions. Both the rock turns and balance step can be danced entirely in place, if necessitated by crowded conditions. Many of these figures can be further embellished by underarm turns. The eight-count figures extend across two measures of music, and utilize the rhythm slow (two counts), quick (one count), quick (one count); slow (two counts), quick (one count), quick (one count). Most of them can be further decomposed into two four-count figures, although this would break the convention that every figure begins in closed position with the man stepping on his left foot. Examples include: the forward and reverse box, the left and right box turns, the closed twinkle with promenade close ending, the fallaway twinkles (16 counts), the promenade twinkels (16 counts), and the serpentine (a/k/a progressive twinkles) with closed footwork. A few, such as the grapevine, utilize a faster rhythm consisting of four quicks. Most of these eight-counter figures resemble corresponding figures in the waltz, with the rhythm modified by extending the first step of each figure to occupy two counts. Again, many of these figures can be further embellished by underarm turns. The American Continuity Style is widely employed in the United States as a competitive dance, and as a base for formation dance and the performing arts. It is the style generally seen in American musical theater productions, and in film. It differs from the social style in that the dancers pass their feet at the end of each figure, rather than closing them. Consequently, dancers progress much more rapidly around the room, in a smooth, continuous manner that gives the style its name. It differs from the International Style in that body contact is optional. This permits the dance partners to assume a much wider variety of positions and, therefore, to execute many types of figures that are not possible in the International Style. As American Continuity Style is expected in Silver Level American Style dance competitions and above, this style is sometimes also known as "American Silver Foxtrot". International Style Foxtrot is the most tightly defined of all the Foxtrot styles, with instructional and competitive syllabi that are tightly controlled by the Imperial Society of Teachers of Dancing. Thus, it is possible to present the following list of International or English style foxtrot figures This is by no means an exhaustive list. Likewise, American Foxtrot is one of the four Modern Smooth dances that form the backbone of American Style Dance competitions held in the United States under the auspices of the National Dance Council of America and USA Dance, and in some other countries. Competitions are again generally held at six successive levels of difficulty: Bronze (beginning), Silver (intermediate), Gold (advanced), Novice, Pre-Championship, and Championship. The Bronze, Silver, and Gold levels are restricted levels in which the permitted set of figures is restricted by rules published by the sponsoring organization. The Novice, Pre-Championship, and Championship levels are open levels at which novel, original choreography is permitted and even encouraged. At the Bronze level, only American Social Style is allowed; this is enforced by rules that require closing the feet at the end of each figure. Either Social or Continuity Style may be employed at the Silver level and higher, but Continuity Style is generally expected. There are multiple, alternative instructional and competitive syllabi published by various organizations, which are compatible to varying degrees with the competitive rule sets. ↑ "Streetswing's Dance History Archives". Retrieved 2009-02-04. ↑ Hawkins, Christina M. (2002). A Compilation and Analysis of the Origins of the Foxtrot in White Mainstream America (Master of Arts thesis). Brigham Young University Department of Dance. p. 18. Retrieved Feb 14, 2012. ↑ "For many years, the Guinness Book of World Records listed Haley's version as the top-selling pop record of all time with 25 million copies sold -- a record that stood until 1997 and which technically remains intact as Elton John's "Candle in the Wind" tribute to Princess Diana was issued a CD-single, not a vinyl 45." 'Rock Around the Clock' Tribute". Retrieved July 11, 2012. ↑ "American Style Foxtrot – Bronze Level". NDCA Approved Figures, Elements, and Restrictions (Rev. July 2015 ed.). National Dance Council of America. 2015. Retrieved 2016. Check date values in: |access-date= (help); "NDCA Bronze American Foxtrot". YouTube. National Dance Council of America. 2013. Retrieved 2015. Check date values in: |access-date= (help); American Style Smooth Bronze Manual. Las Vegas, NV: DanceVision. 2015. ; Maranto, Jim; Maranto, Jenell (2008). American Style Smooth Syllabus: Beginning – Intermediate (Bronze) Foxtrot (DVD)|format= requires |url= (help). Las Vegas, NV: DanceVision. Sochacki, Slawek; Stachura, Marzena (2013). American Style Smooth Foxtrot Choreography (DVD)|format= requires |url= (help). Las Vegas, NV: DanceVision. ↑ "American Style Foxtrot – Silver Level". NDCA Approved Figures, Elements, and Restrictions (Rev. July 2015 ed.). National Dance Council of America. 2015. Retrieved 2016. Check date values in: |access-date= (help); American Style Smooth Silver Manual. Las Vegas, NV: DanceVision. 2015. ; Maranto, Jim; Maranto, Jenell (2008). American Style Smooth Syllabus: Advanced I (Silver) Foxtrot (DVD)|format= requires |url= (help). Las Vegas, NV: DanceVision. ; American Style Smooth Silver Manual. Las Vegas, NV: DanceVision. 2015. ; Maranto, Jim; Maranto, Jenell (2008). American Style Smooth Syllabus: Advanced II (Gold) Foxtrot (DVD)|format= requires |url= (help). Las Vegas, NV: DanceVision. ↑ "The Ballroom Technique", 10th Ed., Imperial Society of Teachers of Dance, London; "NDCA Bronze International Foxtrot". YouTube. National Dance Council of America. 2013. Retrieved 2015. Check date values in: |access-date= (help); "NDCA Silver International Foxtrot". YouTube. National Dance Council of America. 2013. Retrieved 2015. Check date values in: |access-date= (help); Bronze International Style Standard Manual. Las Vegas, NV: DanceVision. 2015. ; Silver International Style Standard Manual. Las Vegas, NV: DanceVision. 2015. ; Gold International Style Standard Manual. Las Vegas, NV: DanceVision. 2015. ; Veyrasset, Victor; Smith, Heather (2008). International Style Standard Syllabus: Beginning-Intermediate (Bronze) Foxtrot (DVD)|format= requires |url= (help). Las Vegas, NV: DanceVision. ; Veyrasset, Victor; Smith, Heather (2008). International Style Standard Syllabus: Advanced I (Silver) Foxtrot (DVD)|format= requires |url= (help). Las Vegas, NV: DanceVision. ; Veyrasset, Victor; Smith, Heather (2008). International Style Standard Syllabus: Advanced II (Gold) Foxtrot (DVD)|format= requires |url= (help). Las Vegas, NV: DanceVision.